Microsoft Access database makes it so easy for you to create or design standard and professional reports using some previously created tables and queries as data sources and to present them in enticing formats using different methods. MS Access also gives you many options and ways of building the reports with less stress. In this tutorial part, I will explain all about report as one of the objects of a database and how to create reports using the various available methods. Report is one of the objects of Microsoft Access database that is used to prepare a database in a format suitable for print out. This is because you have control over the size and appearance of every item and you can display information the way you prefer using report object. It is also used to perform calculations. This is part 1 of chapter 7 of the Free Online Access Tutorial Series at Microsoft Tutorial website. In this part, I will explicitly explain Microsoft Access reports an give you a step by step guide on how to create them using various methods. 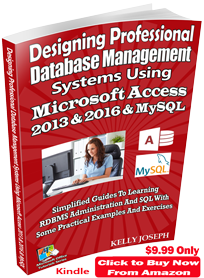 In the previous chapter (Chapter 6), I explained how to learn and build databases in Access and MySQL through SQL in detail. Also see the full tutorial course content of this Microsoft Access Tutorial Series. Reports are a great way to organize and present data from your Access database. Reports enable you to format your data in an attractive and informative layout for printing or viewing on screen. Reports are often used to present a big-picture overview, highlighting main facts and trends. The data in a preview or in a printed report is static. Reports merely present the data; they do not alter the underlying data in the tables. Each time a report is opened, Access displays the most recent data. I will advise you to first create a functional report before formatting it to give it a professional look. Although there are many similarities when working with forms and reports, there are a few major differences also. 1. Reports only display data, whereas forms allow you to display and edit, add, and delete data. 2. Command buttons are often used on forms but are rarely used on reports. 3. Reports have slightly different design sections compared with forms. The last bullet point is worth explaining in much greater detail. As you may recall from Chapter 3, forms have a Form Header, a Form Footer, and a Detail section. Anything in the Form Header displays at the top of the form, and anything in the Form Footer displays at the bottom of the form. The Detail section is where the actual form data display and where most of the form controls are placed. Reports are a bit more sophisticated when it comes to displaying and grouping data, so reports contain additional sections that provide this functionality. All reports have Report Header, Page Header, Detail, Page Footer, and Report Footer sections, and special reports that display grouped output will also have Data Header and Data Footer sections. In addition, a grouped report will have a separate Group Header and Group Footer for every grouping level of data. Below are some of the sections of a report. Report Header: Controls in this section will display at the very top of the first page of a report. This means that the report header is found only at the first page of a report in MS Access. Page Header: Controls in this section will display at the very top of every page of a report. They will appear immediately after the Report Header on the first page of the report. Group Header: This section appears on a report only if you display the report data in a grouped fashion. Every grouping level of data will have a separate Group Header named after the control being grouped. Normally, this section will contain a textbox to display the field you are grouping the report data on. The data result will appear only once for each unique grouping section. Detail section: The detailed record-by-record data appear in this section of the report. If the report is being grouped, it will display every record within that group and then continue to the Group Footer section. Group Footer: This optional section appears on a report only if you display the report data in a grouped fashion. Every grouping level of data will have a separate Group Footer named after the control being grouped. Normally, this section will contain a calculated control to summarize the records in the Detail section. Often, records for each group will be counted, averaged, or totaled. After this section is displayed for one unique grouping, the report will return to the Group Header and then display the results for the next data grouping. The iteration over the Group Header, Detail section, and Group Footer continue until every unique data grouping is displayed. Page Footer: Controls in this section will display at the very bottom of every page of a report. Report Footer: Controls in this section will display on the last page of a report immediately after the last Detail section records and Group Footer results are displayed. I will illustrate these report section when later while explaining how to design reports through the Design Report method in MS Access. Well-designed reports should be organized, grouped, sorted, and presented in a manner that is useful for the end user of the database. If you are building reports that other people will be using or viewing, it is critical that you involve them in the process of designing the report to ensure that it meets their needs. It is very helpful if the end user can provide you with an existing paper report that matches the format and design of the report you are building. If a report does not exist, you should work closely with the end user to develop a hand-written mockup of how the report should look. This will then become the basis for your design of the Microsoft Access report. Once you have a paper design of the report, the next task is to figure out what table or tables your report data come from. 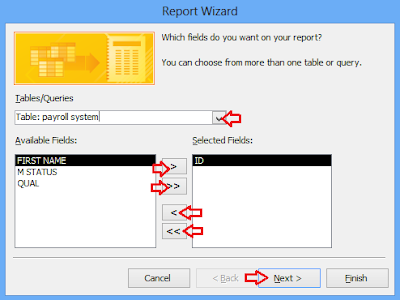 If you need to display data from multiple tables in your report, you will first need to build a query, or if using the Report Wizard, Microsoft Access will build the query for you. That table or query is then assigned to the Record Source property of the report (just like forms). Each view has its distinct purpose, advantages, and disadvantages that are summarized here. While building database reports, you will often switch between these views. This view is used for viewing all of the report data, but it does not show page breaks. You cannot make any design changes in the Report View, but you can apply and remove data filters and instantly see how the output updates. This view provides the most powerful way to work on the design and layout of the report. In this view, you cannot see any of the report data. This view is a combination of Report View and Design View. It enables you to make most design changes to the report while viewing live report data. It is very powerful because it instantly allows you to see how design changes will appear on the report with data. In this view you cannot edit the form data. This view enables you to see all of the report data and pagination exactly how it will appear when the report is printed. You cannot make any design changes to the report in Print Preview. 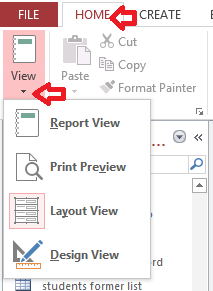 To see the available views for a report, open a report or create a new one and then click the View drop down arrow in the Views group under the Home tab as shown below. Reports are created from one or more tables or queries. To use several tables, you would first create a query to retrieve data from those tables. This is a fast and automatic method that is used to create a report using default design. All you need to do is to highlight your data source and Access does the rest for you. It creates a basic report of the data in the current query or table to which you can add features such as groups or totals. The one-click report generating approach gets you started in a hurry, but it’s not as convenient as it sounds. Most tables have quite a few fields, and an automatically generated report includes them all. The resulting report is often so wide that it stretches right off the edge of the page. You can remove and resize columns after you create the report to solve the problem), but you’ll also need to move the page number and resize the report in Design view. With all that trouble, it’s usually easier to create a blank report and then add the columns you want under the Design view. 1. Highlight your data source (which could be either table or query) for the report in the Navigation pane located extreme right of the Access window. 2. Click the Create tab. Then click the Report icon under the Reports group as shown below. 3. MS Access quickly creates a report using the data from your specified data source and opens it in the Layout view as shown below. 4. You can view it through the Design view and make some changes to the default design if you wish. Save the report with a unique file name when you are through and close it up. This is another method of creating reports in MS Access. It allows you to create a report from the scratch and to your own taste. You first create a blank report and then add data from any table or query of your choice through the Field List Pane and also add custom control types and writing codes. 1. Click the Create tab. Then click the Report icon under the Reports group and switch it over to Layout view. 2. Next, pick your table in the Field List. To add fields to a report, you need the help of the Field List pane. Access shows the Field List pane automatically when you create a blank report, but if you’ve accidentally closed it, you can show it again by choosing Report Layout Tools > Design > Add Existing Fields (under the Tools group) as shown below. 3. At first, Access doesn’t know what to display in the Field List pane because it doesn’t know what table you want to use. It’s up to you to choose one. Click “Show all tables” link and find your data source table in the list, and click the tiny icon next to it (the square with the plus sign in it) to expand the table and show all the fields it contains. Most times, your report fields will come from a single table. But you can also add fields with related information from a linked table. 4. Next is to add your columns to the report. To add a column, click the field in the Field List, drag it over to your report, and let it go in the appropriate position. When you add a new field, Access uses the field name for the column heading, which isn’t always what you want. Luckily, you can rename a column or field directly in your report. Just double-click one to switch it into Edit mode. You can then edit the existing text or replace it altogether. 5. Now, resize or adjust the columns to conserve space for more columns. To resize a column, first click the column header to select it. (A solid yellow line will appear around the column.) Next, move the mouse to the right-side of the column header, so that it changes into the two-way resize pointer. Finally, drag the column border to the left (to make it smaller) or to the right (to make it larger) as shown below. 6. Next, add any other report elements you would want to include in your report, like a title, a logo, page numbers, and the date. — The title is the large-text caption that appears at the top of the first report page. — The logo is a tiny picture that usually sits in the top-left corner of a report, next to the title. — Page numbers indicate the current page (and, optionally, the total number of pages) in a printout. But in Layout view, Access treats the report as though all the data occupies one page, so you need to scroll to the end to see this element. — The date information indicates the day and time that the report was run. Ordinarily, it appears in the header section, to the right of the title. Once you print a report, the date information tells you how recent (and therefore how relevant) your information is. To add any of these elements, navigate to Header/Footer group under the Report Layout Tools > Design tab. Check the second to last screenshot above. 7. Now, fine-tune your report by adding some finishing touches; like changing fonts, colors, and borders. Change the headings, add a logo, tweak the borders, or apply page numbers. 8. 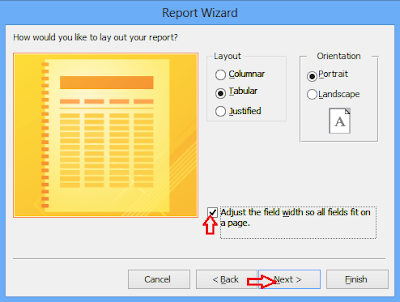 Save your report to use later or print it now by pressing Ctrl + P.
The Report wizard is another method of creating a report. It is a step by step and best method to create a report because it allows you to group or specify the way each data should appear on the report printout and also allows you to specify the field with which the records will be sorted. 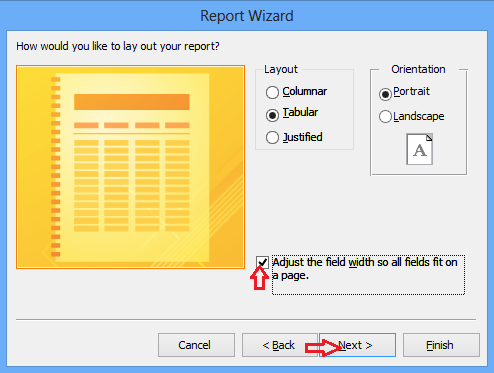 I strongly recommend that you use the Report Wizard to help you when creating a new report. The Report Wizard provides a great professional framework that you can then customize and build upon. Often, the Report Wizard can build about 70% of the report for you instead of you building every single piece of the report from scratch. In addition to the Report Wizard, there is also a separate Label Wizard that is used for creating and printing mailing labels. There are hundreds of canned label formats stored in Microsoft Access, and you can also create custom label sizes if necessary. In the wizard, you can easily filter the label sizes by manufacturer, and then select the product number of your blank mailing labels. The Label Wizard will do the rest to ensure that the label spacing and printing works properly for your labels. 1. 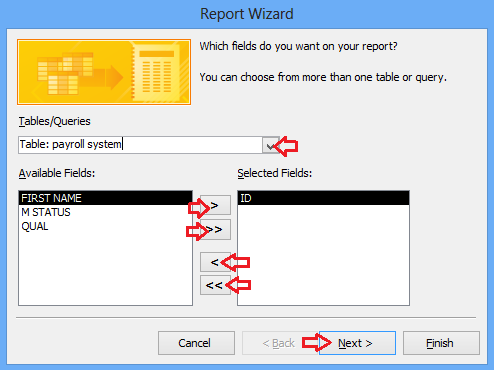 Click Report Wizard located in the Reports group under the Create tab. 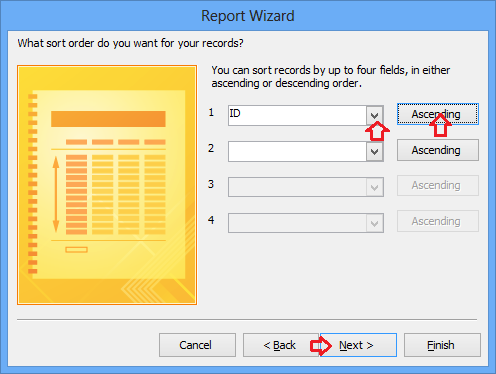 This prompts the report wizard dialogue box. 2. 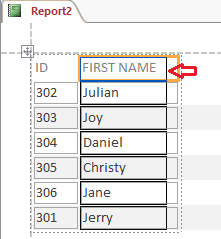 Select the data source table or query and then choose the field name you wish to include their data in your report. Click the > or >> button to select one or all the field names at a time respectively. If you wish to remove one or all the field names, use the < or << respectively. Click Next as shown below. 3. Specify if you want to add a grouping level and then specify the field using the > button. It is optional. When you specify the grouping field, the Grouping Option button becomes activated. You can click this button to see more grouping options. Click Next. 4. Specify a sort order and a field with which the records will be sorted either in ascending or descending order if you wish. You can sort your records by up to four fields. Click Next as shown below. 5. Specify how you want the records in your report to be. Select any layout option from the 3 available options: columnar, tabular (the default) and justified. Then select a layout option from the 2 available options: portrait (the default) and landscape. Also check the box below so that Access adjusts the column width to accommodate all your fields as shown below. 6. Select any background design of your choice. Type in the report name. Click Finish. MS Access then displays a preview of the report. Sometimes the preview may terminate suddenly. It is due to the printer setting of your computer. 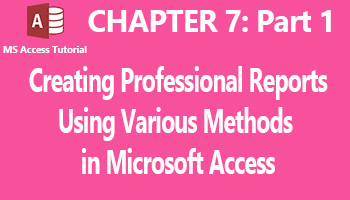 This is the end of chapter part 1 of chapter 7 of this FREE online MS Access tutorial training series. In the next part (part 2), I will give you the step by step guide on how to create a mailing label and different types of charts in MS Access.